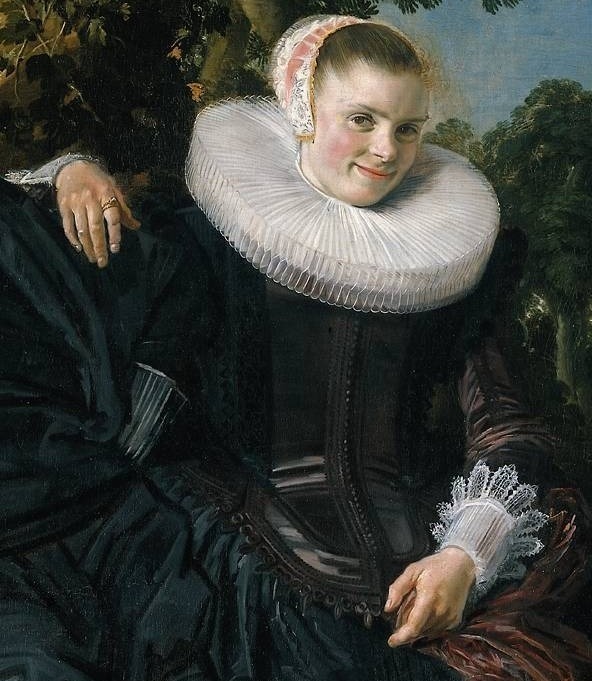 Frans Hals painted many double portraits of married couples between 1620 and 1640. He painted them separately, on two panels, the man on the left and his wife on the right. 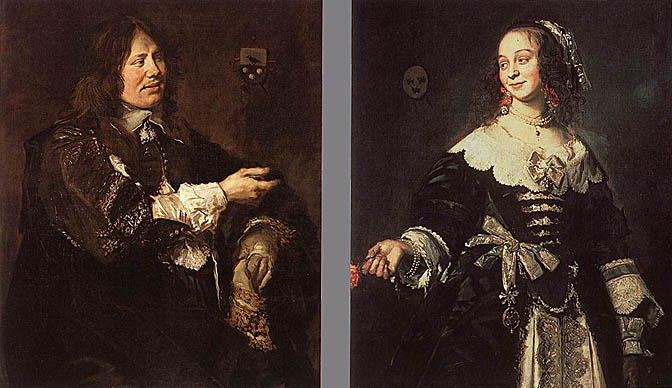 It was only in Double Portrait of a Couple that Hals portrayed the couple, Isaac Massa and his wife on a single canvas. Isaac Massa was a powerful trade merchant and diplomat during the Dutch Golden Age, who had traveled the world. Beatrix was the daughter of a wealthy regent and both came from affluent families in Haarlem. 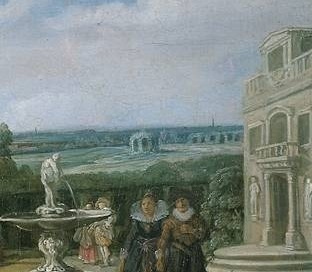 The couple commissioned to Hals paint this canvas to commemorate their wedding in 1622 and it' thought that Hals executed the work on one of Massa's estates in Lisse. 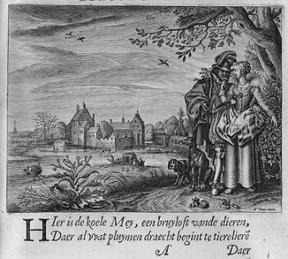 There is a great deal of symbolism in this image regarding marriage in Dutch culture in the 17th century. The couple is not depicted indoors in formal poses but rather they are shown intimately and relaxed. The couple seems completely at ease with each other and Beatrix reinforces their new union in marriage by resting her arm upon her husband's shoulder displaying her wedding ring. Isaac holds his wife's right hand over his heart - a sign of love and loyalty. Smiling faces were uncommon at this time and Hals was one of only a few portrait painters to picture smiling people. The couple's clothes also demonstrate their wealth. The couple sits beneath a thistle tree, which symbolizes fidelity. In addition, the extending ivy tendrils curling around a branch between the couple represents committment, faithfulness and fertility. Hals has included another couple in the background who pose in a much more formal manner. He also inserts a pair of exotic birds behind them which evokes a sense of paradise and 'garden of love' atmosphere. Frans Hals employed artist Pieter de Molijn to paint the background of the Dutch flatlands on the right due to the fact that Hal himself did not specialize in landscape painting. It seems that Hals has drawn inspiration from Love Gardens which were often painted in the seventeenth century. Love gardens were imaginary garden brimming with symbols that referred to love and fidelity. For example, there is a statue of Juno, the goddess of marriage. There are also fountains springing water which is a sign of fertility. The thistle is another important feature. The thistle represents male fidelity and a husband's commitment to marriage. Similarly, the ivy at Beatrix's feet is a sign of eternal love and a wife being bound to her husband. It's possible that Hals was also inspired by an engraving in Jacob Cats' book Marriage, which was published around the time this painting was made and also featured a love garden with thistles. Great attention to detail has been given to the subjects' faces. Unlike conventional panel work Hals completed for wealthy patrons, the couple are not in stiff, upright positions or with blank expressions. The couple's content gazes allow for a bigger narrative and provide insight into the couple's rapport. Hals made Beatrix the focus of this piece and rightly so as she was a new bride. Isaac's body is turned towards his wife, leading the viewer's eye to her. His folded arm on the right also encourages this, as does the middle branch. Beatrix's arm upon her lap returns this gaze by forming a circular composition which leads us back to her husband. The sparse building to the far right creates a three-dimensional aspect to the image. The abundance of foliage also lets Hals' play with various lighting tones and techniques that produce a soft and hazy dream-like atmosphere. For Isaac, bright orange and light brown pastels have been used to define his skin. For Beatrix the artist uses strong white tonal values with a clear sheen that stand out from the darkened image. Overall, Hals uses clean strokes in this work. He is very expressive in the sitter's clothing and makes deep impressions in the numerous folds as they sit in the shade of the tree. These lines are stark and create depth and movement as he accentuates the finer detail of the fabrics. Hals adds fine detail to the cuffs and lace necklines and he paints the lace with very light touches, adding texture to the fine fabric. This technique allows the light to play between the fabrics as well. The trees and surrounding foliage all contain various harsh and bold daubing showing Hal's freedom od expression with is brush. The bark of the tree and ground all have darker yellow ochres mixed with browns and he used multilayering to convey detailed texture. "For truth of character... he was the greatest painter that ever existed... if I had wanted an exact likeness I should have preferred Frans Hals to Titan." Hals painted portraits of married couple for 20 years, demonstrating the popularity of his work and the demand for his paintings. Ater tis time Hals was even more in demand following the death of Peter Paul Rubens and Anthony van Dyck in 1641. 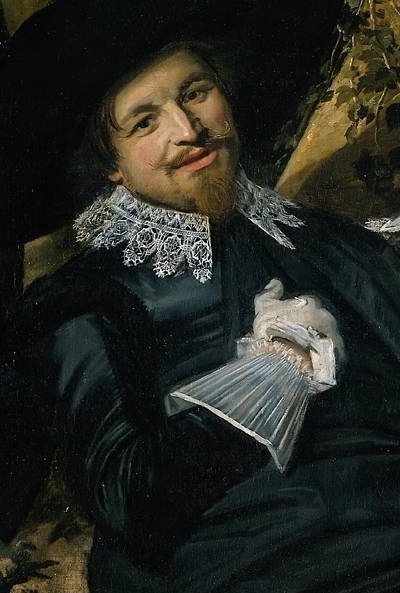 Frans Hals went on to becme the most prominent portrait painter in the Netherlands. Hals won key public commissions and painted portraits for private people, which strengthened his international reputation. John Singer Sargent writes: "You must classify the values. If you begin with the middle-tone and work up to the lights and down towards the darks -- so that you deal last with your highest lights and darkest darks -- you avoid false accents. "That's what Carolus taught me. 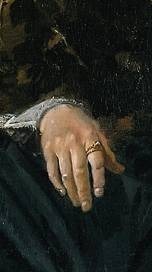 And Frans Hals. It's hard to find anyone who knew more about oil painting than Frans Hals." Double Portrait of a Couple was a unique painting for many reasons. Firstly, Hals painted both husband and wife on one canvas which he had never done before. 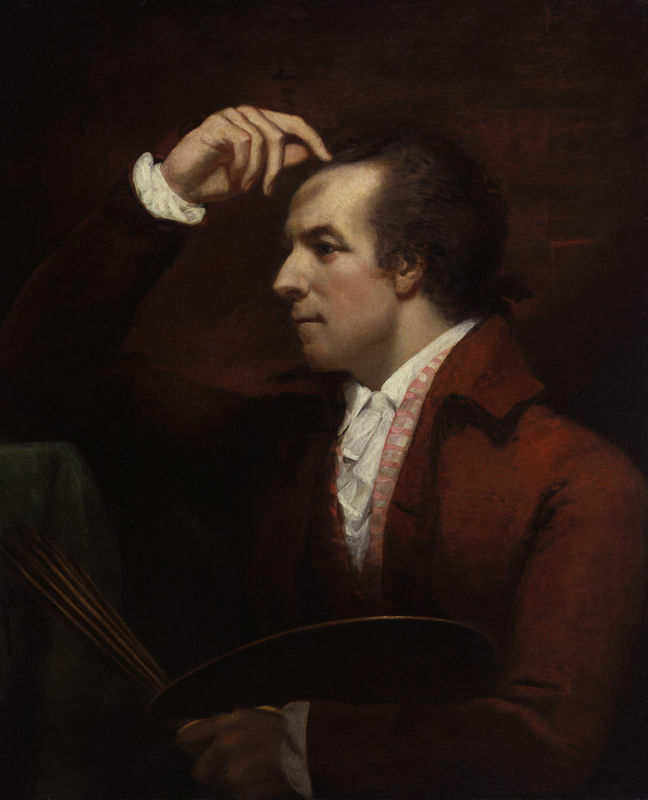 Secondly, he painted them laughing and smiling which was something of a rarity in portraiture of this time. Hals was constantly breaking conventions with his work and setting the trend for emerging artists. Frans Hals established himself as an artist who fully understood his subject and was skilled in capturing the essence of his subject matter. 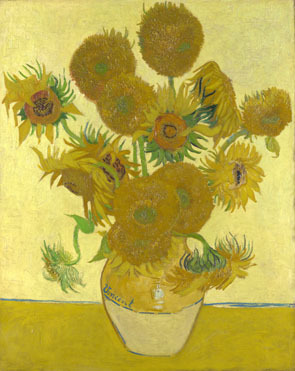 Many Dutch schools went on to teach his work methods throughout the two centuries after his death and he also inspired the Impressionist movement and it's great followers, namely Vincent van Gogh.